New Delhi: Finland can help India in achieving a cleaner environment and sustainable development by sharing its expertise in sectors such as energy and smart city, a top Finnish minister said on Wednesday. Finland’s Minister for Environment, Energy and Housing Kimmo Tiilikainen, while addressing representatives of leading business houses from both the countries at an event hosted by FICCI here, said India is “one of the fastest growing economies” having an “enormous economic potential”. The minister is currently visiting India, leading a Finnish delegation, seeking to strengthen bilateral ties and explore new areas of cooperation. “He (Tiilikainen) met Uttar Pradesh Chief Minister Yogi Aditynath yesterday and discussed possible areas of cooperation,” a senior Finnish official accompanying him said. “Today, he is scheduled to meet Union minister Suresh Prabhu and tomorrow three more Union ministers — R. K. Singh, Hardeep Singh Puri and Harsh Vardhan,” the official said. Ambassador of Finland to India Nina Vaskunlahti and Leader of the Business Delegation Arto Raty were also present during the India-Finland Business Seminar hosted by the Federation of Indian Chambers of Commerce and Industry (FICCI). 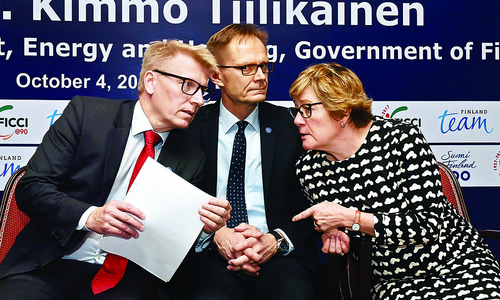 Tiilikainen asserted that Finnish companies were following with “great interest”, the implementation of Prime Minister Narendra Modi’s flagship schemes such as ‘Make in India’, ‘Clean India’ and ‘Smart City Mission’. “I believe that smart city, energy efficiency and usage of renewable energy sources are sectors in which the two countries can cooperate and Finland can help India achieve its aims of cleaner environment and sustainable development,” he said. The minister cited the example of its capital Helsinki and the public-private-partnership platform that has been instituted there — Helsinki Metropolitan Smart & Clean Foundation — to work on clean and smart solutions in order to reduce its dependence on fossil energy. “Finnish companies can help Indian electricity utilities and distribution companies to transform conventional electrical grids into high-performance smart grids with distributed energy generation, intelligent power management with high level of digitisation and demand response equipment where needed,” Tiilikainen said. The minister said that over 100 Finnish companies have established operations in India. Some of the major firms being Nokia, KONE (elevators) and Wartsila (marine and energy). A senior official of Finland’s Ministry of Economic Affairs and Employment said a ‘BCD model’ is followed in that country. “B is for bio-gas based energy sources, C for clean and smart and circular economy and D for digitisation. Our country is working towards a carbon-neutral environment. Our renewable consumption share at present is nearly 40 per cent, which we wish to increase to 50 per cent by 2020,” the official said. “Also, 80 per cent of the renewable energy share is forest-based like biomass. Also, 20 per cent of transport fuel in Finland based on bio-fuel like bio-diesel or bio-petrol and we intend to increase that to 40 per cent by 2030. The whole of European Union uses very little bio-fuel. So, we are a leader in that area,” he said. India is growing tremendously and with the talent and volume of business here, it will be the “best of both Finland and India” if the two countries work together in these areas, the official said. Tiilikainen said both countries were geographically far away from each other, but enjoy “close ties and increasing amount of business and technology cooperation”. “We have noted India’s advancements and ambitious plans to increase energy and electricity consumption, as well as utilisation of renewable energy sources. In fact, India’s policies and plans have many similarities with Finland’s experience,” he said. Finland is celebrating 100 years of its independence and a senior Finnish official said tourism is another sector where both countries can cooperate more. “Recently, a group from India had approached us for shooting a video. They wanted to show the natural beauty of Finland in the backdrop. Hopefully, we will have some Bollywood films being shot there too, in future,” the official said.